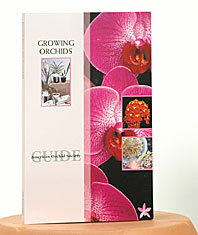 This book, published by the American Orchid Society, was written by experts on cultivation of popular orchid genera, growing areas, pests and diseases, nomenclature and more. Also discussed are orchid names and intergeneric hybrids; growing orchids in the home, under lights and in the greenhouse; repotting; and growing popular genera, including Angraecum, Cattleya, Cymbidium, Dendrobium, Oncidium and Paphiopedilum, among others. A dictionary of less-common orchids describes 16 genera, from Anguloa to Zygopetalum. Fabulous color photographs illustrate specific hybrids, species and growing techniques. More than 120 color photographs. Softcover. 108 pages.